After ordering our lunch,we started our hike to Tapiya falls. Pay attention to your guide, deep ravines with no safety barriers. Just remember to pay attention, stop before you take pictures and listen to your guide. We noticed that the trail was almost downhill all the way. Some trails had 80 degrees downhill, the wooden pole sticks helped a lot. 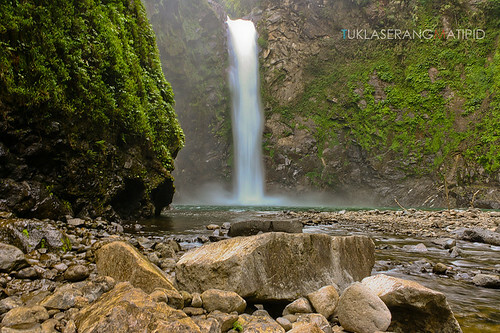 After 45 minutes we arrived at our destination--- The Majestic Tapiya Falls. We stayed here for a while to rest our body and muscle from the hike. Dandy told us that a foreigner just died here while she was swimming. Actually last 2007 Julia Campbell an American journalist a peace core volunteer was murdered along the trail to Batad. See her story here. 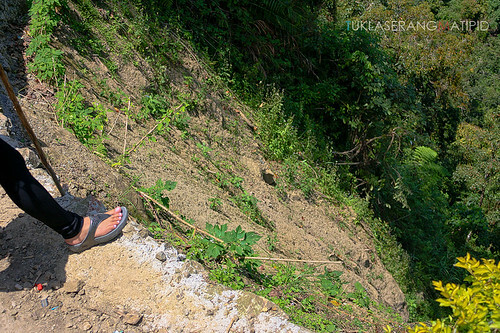 Along the way to Batad, Dandy our guide point the spot where Julia's body was found, but these are all isolated cases. Hiking back to the saddle was the hardest part of the journey. Remember it's 80 degrees downhill when we came but now it's 80 degrees uphill battle. I was really tired and after a few uphill steps we took a rest. We bought souvenir shirts along the way to the saddle. We arrived at the saddle 2 hours after and I was so tired that I looked for Naproxen or any pain reliever hahaha good thing they have FLANAX... Guess what? We our guide "Dandy" awardes us as the first tourist to conquer Batad round trip within a day. 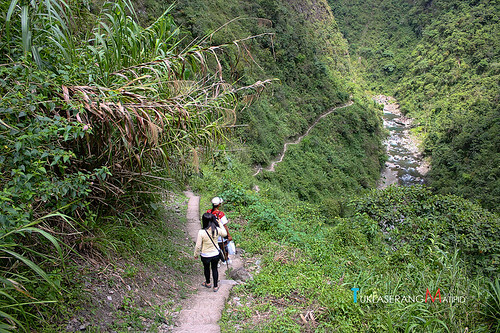 We left Batad right after we finished taking a hot bath back in our hotel and thank our guide "Dandy" for keeping us safe. For Internet Connectivity I tried Smartbro plug in the device, Frustrating!. Not advisable for major downloads and streaming. Mobile coverage is good for Smart subscribers at Banaue. Im not sure about Globe and Sun networks. Bring Cash. There are no banks nor ATMs in Banaue (It really is a very small town!). The provincial capital, Lagawe, 25 km south of Banaue, has a branch of Philippine National Bank and an ATM. Its machine (yes, the only one in the town!) typically dispenses only a maximum of 4000 pesos for a single transaction. If you're paying a hefty service fee for each withdrawl from your foreign bank this could be very expensive. Solano, in the province of Nueva Viscaya, about 70 km away, has several banks and many ATMs. Those of BPI (Bank of the Philippine Islands) dispense 10000 pesos in a single transaction, BDO (Banco de Oro) 10000, RCBC 20000 pesos. For Batad Inns and lodges listed below, you can contact this person to make a reservation. I personally recommend Mr. Dandy Umhao a Batad local for keeping us safe all the time. You can contact him at +639103465310. 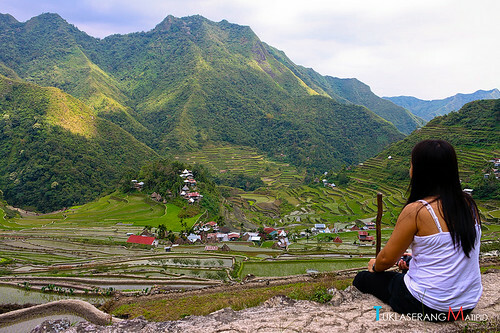 How did you go to Batad junction? You rented a jeepney for how many people? Is it possible to go to the junction via tricycle and not a jeepney especially if you're just 3 people on the trip so it wouldn't be expensive. Hi! Tricycle to Batad junction cost around Php 700- 900. Jeepney rent cost around Php 4500 to the saddle and vice versa. Tricycle is much cheaper though but it will be a tough ride. Are the tricycles can also be rented while at the tourism office. I had no idea. Plus, they April-May is the best time to see the terraces at its greenest. Head to the tourism office and book your trike ride there.